More often than we care to admit, we witness dentists becoming hyper-focused on their social media accounts, spending far too much time and energy on them–instead of taking a wider, more balanced SEO approach. This narrowed approach can sometimes result in unintentional harm to your practice’s other online marketing efforts. The best way to look at social media is as a supplement to your other digital marketing strategies. So Why Do Dentists Even Need Social Media? Now that I’ve said that, you may be wondering why even bother with social media at as part of your marketing plan, if it is only meant to be a “supplement?” In this blog post, we will discuss how to implement social media effectively into your dental office’s digital marketing strategies. When used appropriately, social media can be used like a megaphone to help broadcast the benefits and values of your practice. How does Social Media Benefit Dental Practices? Social media can be used in several ways to benefit dental practices. One major advantage to having an active social media presence is that it helps create consistency in your practice’s message and values. Prospective patients will be looking to see if a new dentist has a presence on Facebook, Twitter, or LinkedIn, and may become frustrated or even suspicious if they cannot find your offices in those popular locations. In general, a potential patient wants to be able to engage with you in the same ways they are able to engage with other practices. There are countless ways that your practice can be found online – whether that be via a Facebook business page, your blog, website, or through interaction on Twitter. However, if your dental office is not active on any of these platforms, then potential patients won’t be able to find you. Another benefit of social media is in improving the visibility of your practice in online searches. You can display your social media profiles on your website and vice-versa to boost the reach of your practice and increase your ranking on the SERPs. There may even be times that your social profiles actually rank higher than your website, so their value cannot be overstated. When social media is utilized effectively it can help drive qualified traffic to your website and blog. Ultimately, it can also be extremely beneficial for your dental practice. Which Social Media Sites Are Best For Your Dental Practice? Your sites should compliment your practice in addition to your patients. For example, platforms such as Snapchat, Pinterest and LinkedIn may not be as useful as platforms like Instagram, Facebook and Twitter, which may fit the needs and voice of your practice more. The specific sites you choose will allow you to connect better with potential patients on a level that makes them feel more comfortable. Choosing the right social media platforms to publish profiles on is crucial. Joining every single social channel you come across won’t be particularly helpful if those channels aren’t being used by your prospective patients. In addition, using too many social media platforms risks diluting the message you are trying to convey, and can make it less effective. Similar to choosing an online directory platform you need to be selective with the social media platforms that you utilize. Social media accounts do take a bit of time and effort to maintain, and you will need to stay current on industry trends, and post relevant content on a consistent basis. 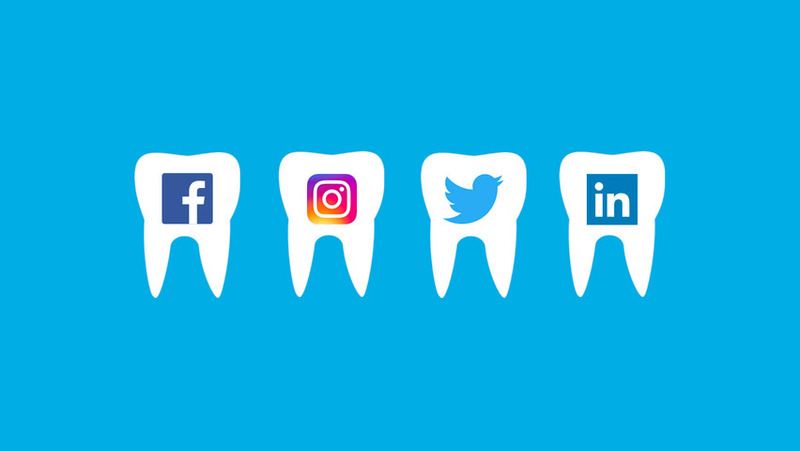 When a dentist decides to join all the social media platforms it becomes nearly impossible to remain and consistent effective across all the platforms. They each have different capabilities and features, and they may not all be appropriate for the needs of your dental office. In the case of social media and choosing how many platforms your practice should join you should adopt the “quality over quantity” philosophy. It is not necessarily important how many platforms you join, but instead how effective you are on the platforms you decide to join. A tactical approach can save you time and money and will ultimately result in more success than a “shotgun” approach. How Can Dentists Use Social Media Effectively? To become proficient in how social media works, you must determine what works and what doesn’t work for your individual practice. Learning and adjusting as you go takes time and patience, but is well worth the effort. There are several social media publishing platforms available that may help you streamline and automate some of the process. This may allow you to spend less time and energy on managing your social media, and then it will fit seamlessly into the rest of your digital marketing approach. Choosing the right platforms to establish yourself on is only the first step of the process. The next phase of the process is turning social media visitors into web traffic, and from there converting them into patients. Social media marketing isn’t an unsolvable puzzle. It does not need to be tricky or time-consuming. AdInfusion gives you the game plan to engage potential patients by publishing blog posts to your site while managing your social media. To learn more about how AdInfusion takes the mystery out of the effective digital marketing for local dentists, call us at 916-798-5707 today!